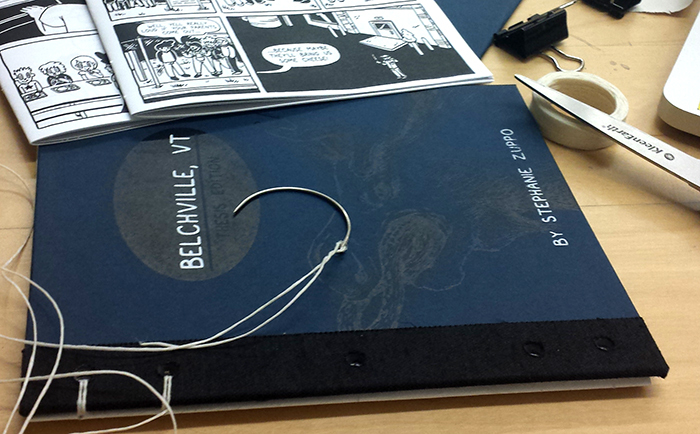 So, for the past year, I’ve been working on issues 2 & 3 of Belchville, VT for my thesis at The Center for Cartoon Studies. I decided to make a handmade coptic-stitched hard cover book to contain all 3 issues and I documented it each step of the way. 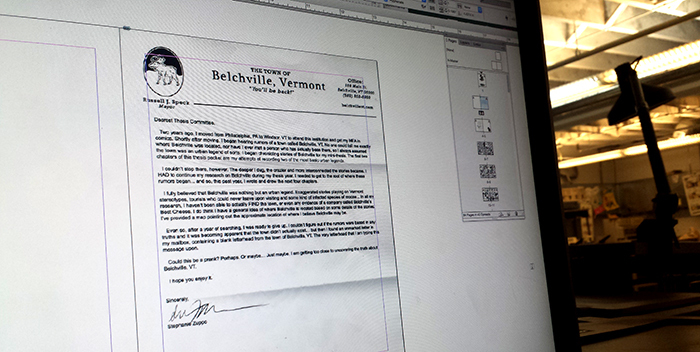 I began by laying out everything in InDesign, which takes way longer than it looks. When printing a booklet, the whole book has to be a multiple of 4 to print correctly, so that takes a bit of planning. Also, since I was coptic binding, I wanted to do signatures. To do signatures, your pages should be a multiple of whatever number of signatures you want (but still be a multiple of 4! Ack!) My book - comics & extra stuff - ended up coming out to 84 pages, so I did 3 signatures. Then, I printed out EVERYTHING. I printed out my “guts” and the black layer of my front & back covers. I also trimmed everything on my school’s industrial paper cutter, including my bookboards. Since my cover was dark blue with black print, I had to screenprint the the title and my name in white so it would stand out. After that dried, I began gluing my covers to my bookboard using neutral PH PVA. That stack of paper in the back was used as weight as the glue dried. The after the front and back covers were glued, I glued a cut piece of book cloth to the spine. When that dried, I cut and glued my cream speckletone paper to the inside covers. And dude… gluing took FOREVER. It was definitely my least favorite part of this whole process. It was torture. Since I wanted to put non-Belchville related thesis work on a CD in the back (and also Belchville stickers), I decided to make a pocket for the back cover. I kind of guesstimated this part. You can kind of see how I cut it in the picture above. 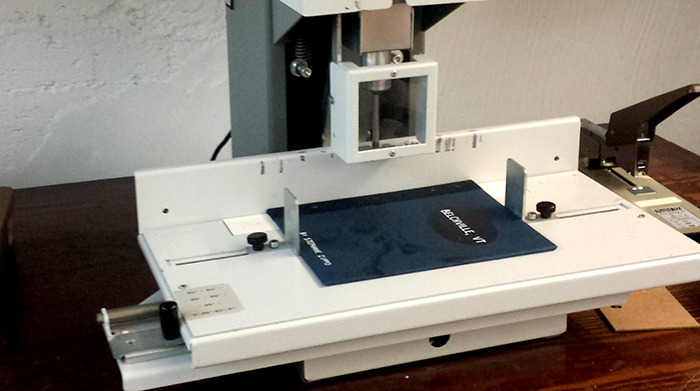 The sides were folded and tucked under the piece that was glued directly to the bookboard, so it looked seamless. It worked out pretty great, except that I glued them on backwards… they still work the same though. It's cool. I love this machine. My school has a lot of really amazing bookbinding machines which I love, but I never had the chance to fully appreciate this one until now. This is a drill press. It drilled the 5 holes through my paper and bookboard so that I would be able to coptic stitch. This thing is the best. The last step was sewing this whole dang thing together! I was taught to use these curved embroidery needles by wordsxpictures and they make coptic stitching like 10000x’s easier. THANKS ASHLEY. <3 But yeah, I actually really like this part of the process.